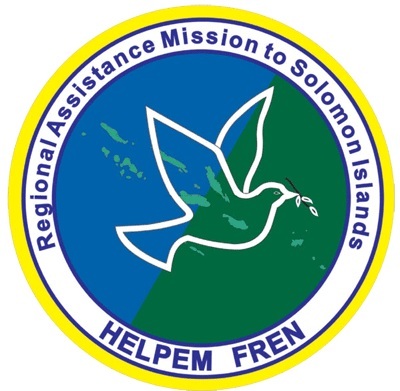 The Regional Assistance Mission to the Solomon Islands (RAMSI), also known as Operation Helpem Fren, was created in 2003 in response to a request for international aid by the Governor General of the Solomon Islands. "Helpem Fren" is Pidgin English for "helping friend". More research needed, it seems to me, to determine whether this flag is official or a flag manufacturer's invention, perhaps based on a mission logo. www.diggerhistory.info/pages-badges/patches/recent.htm shows a shoulder patch, but of the sites I've found so far, only the flag manufacturer's site located by Valentin has an actual flag for RAMSI. Emblem of organization on a white bedsheet. (Emblem) "Helpem Fren" refers to Operation Helpem Fren, the alternative name of the mission. I am guessing it is Pidgin for "Helping Friends." There is apparently also a variant of the RAMSI flag with the emblem displayed on a green field (second from the top on the right). I'm not sure which is the official flag and which might be an unofficial variant or simply someone who got it wrong. Flag in the middle is of a police force. Its flag is similar to white version of RAMSI but its badge based on Solomons' flag, and title of organization is written at upper part of the logo. The Participating Police Force (PPF) was deployed to the Solomon Islands as part of the Regional Assistance Mission to Solomon Islands (RAMSI), with the intention of restoring law and order and strengthening and reforming the Solomon Islands Police Force. The PPF includes police from 13 member states of the Pacific Islands Forum, deployed to Solomon Islands under Operation Helpem Fren, from July 2003. However the PPF has always been commanded by an officer of the Australian Federal Police (AFP), who is also sworn in as the Deputy Commissioner of the Solomon Islands Police Force (SIPF).